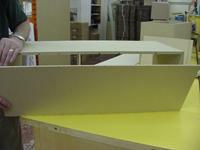 We recently built shelf dividers to fit into a cabinet in our warehouse. Today's tip will show you how we used the Oak Park 1/4" Spacer Fence in a reversed position to cut 1/4" divider grooves quickly and easily! 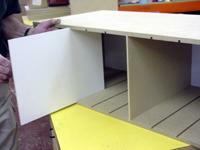 2) to simplify the cut list so the ends and dividers are the same size. 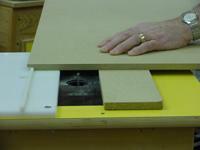 Both the dado and groove cuts will be 1/4" deep or half the material thickness. 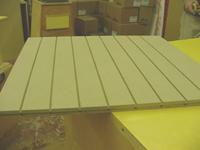 The top and bottom have 1/2" dado cuts at both ends, 8 divider grooves and 9 equal spaces of 3 1/4" for a total length of 32 1/4". The 2 ends and 8 dividers will be 11 1/2" x 15". The back will be 12" x 32 1/4". 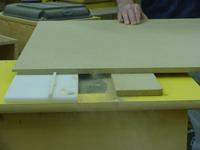 You can either cut the top and bottom to size first (15" x 32 1/4") or leave it as one larger piece (30 1/8" x 32 1/4") and cut it later on the table saw. We did the latter. 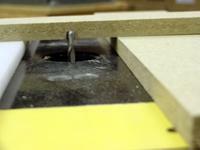 Using a table mounted router set the bit height to 1/4" and clamp a table fence into position so 1/2" of the bit is exposed. 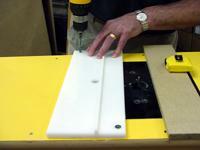 Run a dado on both ends of the board. Next install a 1/4" spiral cutter in a table mounted router. Reverse the 1/4" spacer fence and bolt the top end in place using the existing hole in the fence and the Oak Park table top. 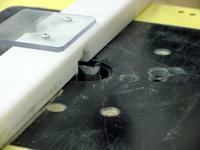 Measure 3 1/4" from the fence to the bit and drill a new 1/4" hole through the fence and table top at the bottom. Bolt into position. Set the bit height to cut 1/4" deep groves. 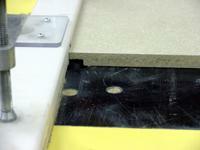 We used double stick tape to attach a piece of 1/2" thick scrap material to the table top on the opposite side of the bit for support to keep the material flat when cutting the 1/4" grooves. We are now ready to cut the grooves. 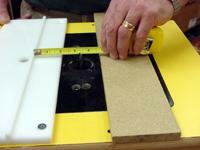 Lay your board with the dado against the 1/4" spacer fence stick and cut the first groove. Next insert the groove over the 1/4" stick on the spacer fence and make another pass. 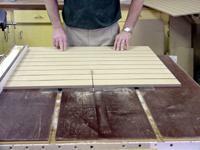 You can continue this way to do all 8 grooves or do 4 from each end. To complete the project glue and nail the top and bottom to the ends. 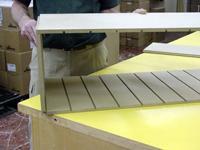 Nail the back to the "box" frame and slide the masonite dividers into place. You now have a well organized storage bin.